MORE than a decade ago, getting into the entry-level model Mercedes-Benz proved a distinctly different experience. Apart from the three-pointed star ornament sitting proudly on the bonnet, the base model looked and felt like its line-up positioning. Bereft of grandeur or presence, those who had finally "made it" into the world of luxury motoring could rightfully feel disappointed. Stepping into a C200 is a vastly different world nowadays. Piano black finishes, large central colour screen and digital instruments for the driver ... base no longer means compromising features for the sake of the badge. Opulence comes the higher you climb up the C-Class tree, where the mouth-watering AMG version sits with a price tag of $160,900, yet the $63,700 C200 is far from a stripped out budget derivative. From the outside this recently updated C-Class looks similar to the one introduced in 2014. But more than 50 per cent of the car was updated or changed as part of a model update last year. 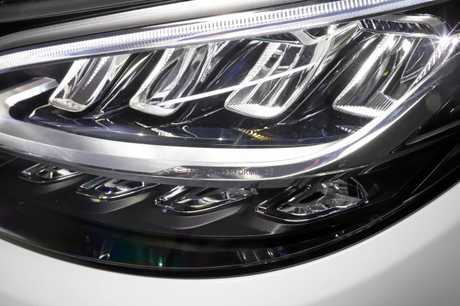 Different bumpers, grille, alloy wheels and lights set it apart, yet it's the interior where improvements shine. While it doesn't have the Siri-like voice activation functionality available in the A-Class and Sprinter, called the Mercedes-Benz User Experience, the colour screen and operations look up-market and the operations are simple to navigate. Thumb pads on the steering wheel help operate the main 10.25 inch central screen and the driver's customisable 12.3-inch instrument display. 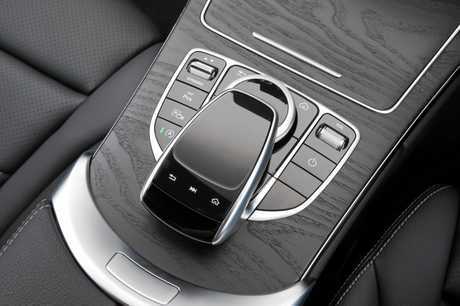 The system has Apple CarPlay and Android Auto for improved smartphone integration, along with synthetic leather seat trim that many would fail to pick from the real thing. Other inclusions are press button start, 18-inch alloys, satnav and impressive LED headlights that deliver extra lighting around corners when driving on rural roads and automatically provide more vision depending on the conditions and oncoming traffic. Service intervals are annual or 25,000km, with a package covering three years available for $1980. With nine airbags and suite of gizmos, the Mercedes sedan gets five-star safety. Kit includes autonomous emergency braking that operates up to 105km/h. Pre-Safe, which works above 30km/h, automatically tensions the seatbelts and adjusts the seats for maximum support if it detects a possible collision. Blind spot monitoring is standard, as are parking sensors front and back, along with Active Parking Assist for parallel or right-angle positions. One omission is radar cruise control which strangely isn't standard or an option. Adopting Benz's EQ Boost functionality, a mild hybrid set-up that kicks in an extra 10kW/160Nm at low speed, it helps get the C-Class off the line with additional firepower. The engine has been downsized to a 1.5-litre unit and the standstill to 100km/h sprint time has lengthened slightly to 7.7 seconds. Not that it will deter most sensible buyers of the sedan, this model is all about smooth luxury. Requiring no driver initiation, EQ works seamlessly with the four-cylinder engine. It essentially provides the extra boost at low speed before the turbo kicks into gear. One of the benefits of a downsized donk is at the petrol pump where we only needed to fill up with premium unleaded after using less than seven litres for every 100km. Good going for family hauling. 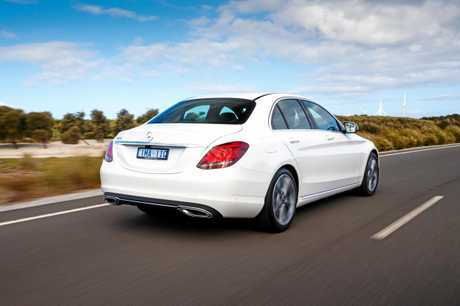 Maintaining balance and poise, the C-Class proved a talented all-rounder. While not outrageously quick, nor overtly sporty, it manages daily tasks with ease and grace. 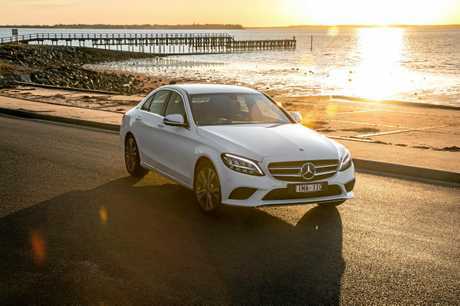 As good as the 1.5-litre is, until the end of February Mercedes is offering a free upgrade to the 2.0-litre C300 with an extra 55kW/90Nm worth $8000. It's an offer too good for most to ignore, with sharper acceleration and marginally heavier fuel consumption. Among the options worth exploring is Dynamic Body Control with three-stage adjustable damping for $1400, or the cosseting S-Class-style Air Body Control for $2400. It's been Australia's best-selling luxury car for the past 10 years, and the most affordable Mercedes of the C-Class range doesn't feel or look like I've skimped. 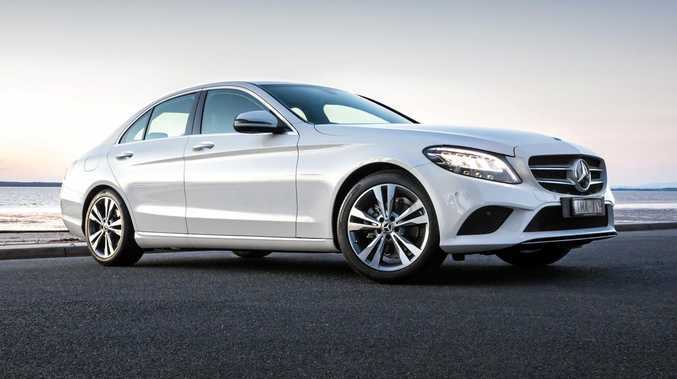 There is much to love about the experience, but most importantly it wears the three-pointed star on the grille while possessing rear-wheel drive prowess and high levels of luxury. 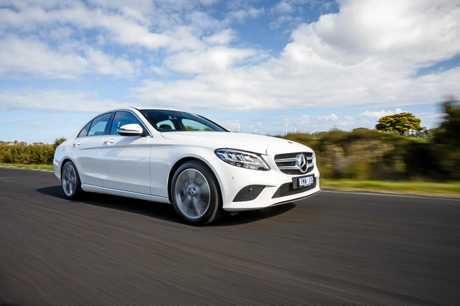 Powered by a 110kW/250Nm 1.4-litre 4-cyl turbo petrol, an accomplished sedan in front-wheel drive. It's slower than the C-Class, with a 0-100km/h sprint of 8.5 seconds, but the price tag enables a few extra options to be ticked to increase luxury levels before matching the Benz sticker. Underrated offering, the Alfa is a fun driver courtesy of a 147kW/330Nm 2.0-litre 4-cyl turbo, eight-speed auto and a loaded interior that includes soft Italian leather.